Sassafras formed in 1970 as a three-piece band with guitarist Ralph Evans, bassist Ricky John Holt and Rob Reynolds (drums). Shortly afterwards guitarist David (Dai) Shell was drafted in and the line-up was completed by vocalist Terry Bennett. An early line-up change came with the replacement of drummer Rob Reynolds with former Love Sculpture sticks man Bob ‘Congo’ Jones. The band recorded some early demos in Cardiff’s Ddraig Studios (set-up in part by Dai Shell). It was with this line-up that the band signed to George Martin’s AIR Productions in 1972 and would release their debut album, Expecting Company, on the Polydor Records label in October 1973. The opening track immediately introduces us to the band’s trademark twin lead sound and comparisons to Wishbone Ash may serve as a useful pointer here. An infectious stomper of a track with a Southern rock swagger. The title, Busted Country Blues pretty much sums up the music on this track, although well written and performed, it does little for me. Beans And Things on the other hand is a great little rocker and reminded of Del Bromham’s Stray. The lengthy middle instrumental takes on a percussion groove rather than concentrating on an avenue for the guitar. The closing track from the original album was Across The Seas Of Stars and introduces a more psychedelic vibe to the album. Indicative of the times the track boasts an incredibly lush and infectious chorus with soaring vocal harmonies. The track also features a great bluesy solo reminiscent of Peter Green’s Fleetwood Mac. So opening side two of the LP therefore was School Days which reintroduces the twin lead work of Ralph Evans and Dai Shell. Again great classic rock song with a change of pace to round of the track. The closing two minute coda is tastefully done guitar solo and well worth checking out. I always considered side two of the album as being more adventurous and certainly listening to The Way Of Me reaffirms this notion. We still have the twin lead sound, but played in a slightly more twisted and darker fashion. Terry Bennett delivers a fine vocal performance here whilst the middle, more acoustic section, features an un-credited lilting flute. Despite its promising title The Goose That Laid The Golden Egg remains in the Canned Heat mould of good time boogie rock. So just remaining from the original album is the two part Expecting Company/Meanwhile Back In Merthyr. The first part and title track is a song based affair whilst the latter forms an extensive instrumental break to conclude the album. The bonus material comprises of the band’s 1974 single Oh My [Don’t It Make You Want To Cry] accompanied by the B-side Kansas City Wine. The production on the A side of the single indicates that Polydor saw hit potential with Sassafras with the noticeable improved production values and added brass section. The band went on to record two more studio albums, on the Chrysalis Records label, Wheelin’ N’ Dealin’ (1975) and Riding High (1976), however despite good coverage in the press, appearances on The Old Grey Whistle Test and notable rock radio shows of the time, festival appearances and major support slots, the band didn’t quite manage the notoriety of Welsh counterparts Man, or perhaps more notably those other early pioneers of the twin lead guitar Wishbone Ash. 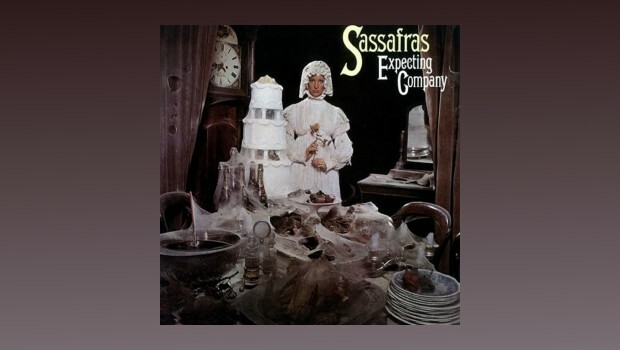 Despite this Sassafras have left us a fine legacy with their three studio albums and with companies like Esoteric Recordings prepared to re-master and reissue these lost little gems, then their music will not be forgotten.